Smaller subwoofers are a lot better than having nothing at all, but when you really want to shake the block, 8” or 12” just isn’t going to cut it. Before you proceed, you’ve got to understand that this is a serious commitment to bass. You’re going to need a powerful amplifier, but you know that already. If you want to feel your music at the very core of your existence, you’re on the right path. Even an incredible subwoofer at a smaller size just isn’t going to be able to hit those deepest, darkest notes that you’ll get out of your 15” subwoofer. Whether you’re looking for something that’s a little more on the affordable side, or you’re looking for full-on competition grade subwoofers because you’re tired of playing games, we’ve covered the gamut with the following choices and we’re confident that there’s something for everyone on this list. It gets very loud, and the bass is very powerful. Overall, this is the best 15 inch subwoofer you’ll likely find. The HCCA152 is a heavy-hitter, with an SPL that’s off the charts. If your setup can handle it, and you’re willing to sacrifice most of your trunk to carry around this huge, heavy monster of a subwoofer, you’re in for a real treat. If you’re at all on the fence about diving into the deep end, this one isn’t for you so keep reading to find something a little less all-in. Orion’s HCCA (which stands for High Current Competition Class) brand of competitive car audio gear dates back to the 80’s, but remains as relevant as ever. That familiar red paint staring you in the face lets you know that you’re about to be absolutely demolished once these things kick in. These subwoofers get LOUD. The oversized rubber surround gives you some insane excursion, if you take a slow-motion video you’ll see about 4 inches of movement. All the power being pushed through this sub creates the opportunity for a lot of heat on the voice coil, but there’s a cooling system in place to help dissipate some of the extra heat. Little details like that help with justifying the price, but once you get a chance to push this subwoofer, it really speaks for itself. It’s not the best option for everyday, casual listening (most 15” subwoofers aren’t), and it is pretty power-hungry so make sure you’ve got an amplifier and an electrical system that can handle it. If you’re looking for the advantages of a 15” inch sub, but want something that’s a little easier to drive, you’ll want to check out some of the other options because the Orion HCCA152 is not for the casual listener. It’s very heavy. You’ll notice many of the cheaper subs don’t weigh nearly as much. Overall, this is the best 15 inch subwoofer you’ll find on this page. It takes a lot of power to get it moving at full force, and takes a lot of space for installation. But if you’re in the market for a subwoofer like this, those aren’t cons that you’re going to worry about it because you understand the end goal is worth it. Provides Big sound with a smaller footprint. Don’t worry, it can still get plenty loud and rumble your whole world. If you’re looking to shake things up without going all-in on competition-tier equipment, this is a great middle ground. It’s a clear upgrade over most subs, without being too over the top. Rockfoord Fostage has been innovating car audio since the early ‘70s when Jim Fosgate was tinkering with designs in his garage. They’ve come a long way since then, and are one of a handful of legendary brands in the car audio space. But reputation isn’t enough, you’re only as good as your last speaker. This sub continues that tradition, and fills an important section of the market, even if it’s not the most powerful 15 incher out there. With 600 watts RMS, and 1200 watts peak, these are on the lower-end compared to some of the other subwoofers on this page. Having said that, it still hits plenty hard. Because of this, it’s a great choice when you are working with a more limited source of power but you still want huge, deep bass. Feels a lot more powerful than the wattage would suggest. Very well-made from a reputable brand. This is a great way to step into a super-system without quite diving into the deep end. It’s not going to move as much air as higher-end 15” subwoofers. Excellent, deep bass but won’t get as loud as other options. In this case, it’s a good trade off, and an excellent subwoofer. From the moment this subwoofer starts gobbling up power, you’re going to know exactly who it was designed for: the discerning basshead. It’s not just about loudness, either, the bass sounds rich and full and is the perfect way to round out the bottom end of your soundscape. The square design isn’t just a gimmick, so believe the hype. Some people like to grab two of these and pair them up, but even one of them will give you that hard, violent bass that will drop jaws and rattle eardrums. The advantage of the square design is that it can theoretically displace more air than a round speaker, if you’re talking about subwoofers of the same size, due to the extra surface area you get with a square. In any case, this still relies heavily on properly building and tuning the enclosure. Kicker’s patented square design gives you 18% more cone than a round subwoofer, and it’s noticeable. If you’ve got a monoblock amplifier that can handle 1000 watts RMS and 2000 watts peak, this 15 inch subwoofer from Kicker and your amp are going to become fast friends. It packs some serious punch and amazing sound quality for this price range. Perfect choice for getting right up there in terms of quality, without breaking the bank or hitting the point of diminishing returns. The square design isn’t for everyone. If you’re buying a pre-built enclosure, your options will be more limited. This is a loud, powerful subwoofer that won’t break the bank. It’s a good upgrade from a budget sub, and offers massive value, but without being too cheap. It’s not going to check all of the boxes for someone looking for audiophile gear, but as far as stuff for the regular consumer, this hits hard and loud and it’ll definitely turn heads. We need to establish a bit of context before judging this particular subwoofer. Here’s the deal, it’s got some serious power at 1400 watts RMS and 3000 watts peak, but you’ll notice it’s also priced a lot lower than some of the other super powerful subs we’ve featured. If you want to save some cash when you’re buying a sub, you’ll have to make certain sacrifices. Either you’ll need something smaller, less powerful, quieter, lower sound quality, or lower build quality. It’s all about balancing those specs and finding what suits your needs. In this case, you’re going to lose a bit when it comes to build quality and it’s just not going to sound as amazing as subwoofers that cost three, four, or five times as much. You’re getting the power here, and you’re getting the depth that comes from 15”, and all things considered – it’s going to absolutely shake your car, but it does leave a bit to be desired when it comes to overall sound quality and build. That’s not to say it’s terrible, and it’s not the most budget option we’re featuring, so if you’re looking to get away with not spending a ton, this is a safe bet. Offers a ton of value for the price, very massive bang for your buck. Powerful, loud, and very impressive overall. Your passengers won’t be able to tell that you didn’t spend a small fortune on it. If you want that ultra deep bass that you feel deep in your stomach, this one isn’t quite there. The build quality isn’t the best. It’s not going to fall apart in your trunk or anything, but if you put it side-by-side with a high-end subwoofer, you can tell the build quality is not the same. Serious power that’ll change the way you experience your music. This gives you everything you would want from a 15” subwoofer, and it’s very well-made, with some helpful extra features like the dual voice coils to round out a nearly flawless offering. DS18 makes subwoofers that run the gamut from as budget as budget gets, all the way up to competition grade. Their EXL line represents the higher-end, peaking at 2500w, and gets down to 25Hz with the newer model. We need to point out that the final sub on this list that we’ll be checking out in just a moment claims to reach 25Hz as well, but not all Hz are created equal, and the DS18 EXL-X15.2D sounds objectively better, so you can’t always rely on the specs to tell the full story. There’s a difference between being able to hit a frequency at a loud volume, or only being able to hit it whisper-quiet. With that out of the way, the DS18 is a great alternative for someone who was looking at the Kicker 11S15L72 but was turned off by the square shape of it. This subwoofer is built like a tank. The dual voice coil gives you more flexibility for wiring your system. At 35 pounds it’s definitely heavy, but not the heaviest. It’s big and powerful enough to easily replace a pair of 10” or 12” subs with just one 15”. There are lots of subwoofers to choose from in this price range, and this is one of the most well-rounded options. They won’t play nice with amplifiers that aren’t good enough, which isn’t the end of the world since you’ll want an amp that can push this sub to its peak, anyways. 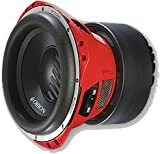 A budget subwoofer that still has size, power, and a deep frequency response to hit those deep bass notes and rumble your car in the process. It’s not super well-made, it’s very light, but it’s still a capable subwoofer. Even if you’re saving some cash on the sub, don’t skimp out when it comes to your amplifier. Make no mistake, this is a budget option through-and-through. It doesn’t stand toe to toe with the high-end competition grade subwoofers we’ve featured, but that’s okay. There’s a school of thought that if you’re going to spend the money and the time putting together your enclosure, you may as well pony up some cash to put something incredible inside of it, but that’s not always possible. The first thing you’ll notice is that the Planet Audio AC15D is considerably lighter than some of the other beasts we’ve featured here. It comes in just over 15 pounds, compared to some that are upwards of 50. That’s going to leave you with a significantly less dense, less powerful, and lower quality output. Just because it’s in the budget-tier, it doesn’t mean it’s a bad sub, it just means you get what you pay for. You can’t reasonably expect this to perform the same as a sub that costs 10x as much, but if this is what you’ve got room for in your budget, then it’s a good choice in this price range. Peak power of 2100w and a frequency response of 25Hz is nothing to scoff at, but keep in mind that not all power ratings or frequency response charts are created equal, either. 25Hz on a competition-grade sub is not going to sound the same as 25Hz on a budget subwoofer, so it’s all about managing your expectations. If you manage your expectations, you’ll be pleasantly impressed. You won’t be winning any competitions with this anytime soon. It’s not on the same level as any of the other subwoofers featured on this page, but if you’re working with a super tight budget, it’ll do just fine.